If you’ve ever had to eliminate your favorite foods from your diet, you know it can be difficult to find substitutions. And if you have celiac disease or food allergies, it can be quite challenging to find products that meet needs yet still taste great. This is basically why I created my blog to try things out so others know what tastes good and what doesn't. 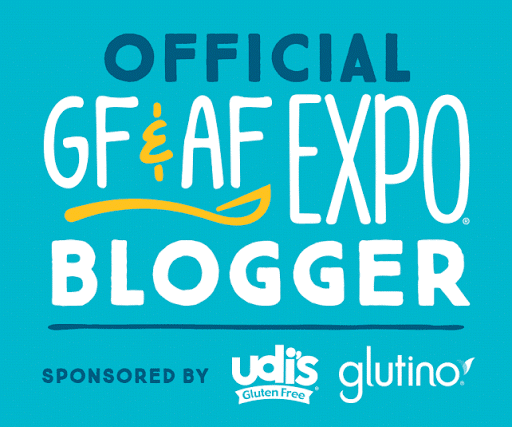 The Gluten Free & Allergen Friendly Expo (GFAF Expo) started back in 2007 in one city and now has expanded to eight cities. 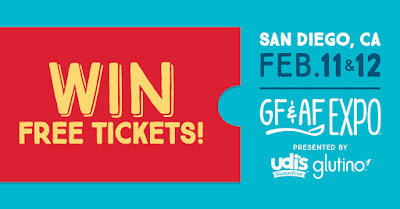 The GFAF Expos are the largest and fastest growing special diet consumer events in the US. At the event some of the things you can expect to see are over 100 vendors showcasing their products, samples of products and informative classes related to living a gluten free and allergen friendly lifestyle. 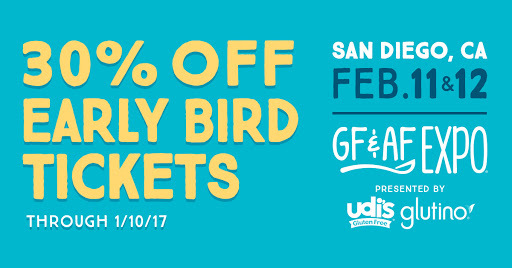 To kick off 2017 the first GFAF Expo is in San Diego, California (February 11-12, 2017) at the Del Mar Fairgrounds Wyland Center. This will be my very first time attending the GFAF Expo. Besides getting to meet vendors and get samples, I am most excited about the opportunity to attend classes and listen to the guest speakers. Another exciting piece is I am one of the official bloggers for the GFAF Expo in San Diego. As an official blogger I will be sharing my weekend experience LIVE via Twitter, Facebook and Instagram. I have also been given 5 tickets to give away. One ticket will be given away to my local celiac support group in Sacramento and the other 4 you can win by entering the giveaway here on my blog. 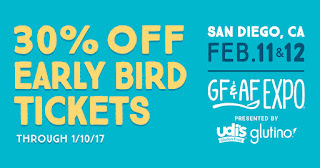 Each ticket is a single day Adult pass that can be used on either day of the San Diego Expo. I have 4 Single Day Passes to giveaway. To enter use the rafflecopter below. Entries close January 10th, 2017 at 12am PST. I will choose 4 winners and announce them on my blog on January 12th, 2017. Winners will need to contact me via email (janelberchielli @ comcast dot net) to obtain information on how to receive their Ticket. I will also do my best to contact the winners via email they provide to rafflecopter. Did you miss the entry or just can't wait? You can purchase tickets via my affilate link. I also have special promotional discount codes for my blog readers to use. Disclosure: This post is sponsored by the Gluten Free Allergen Friendly Expo. I am receiving complimentary admission to the event in exchange for participating on the blogger team. I am also a part of the affiliate program for ticket sales.